Happy National Cereal Day!!! Did you know that March 7th is National Cereal Day? 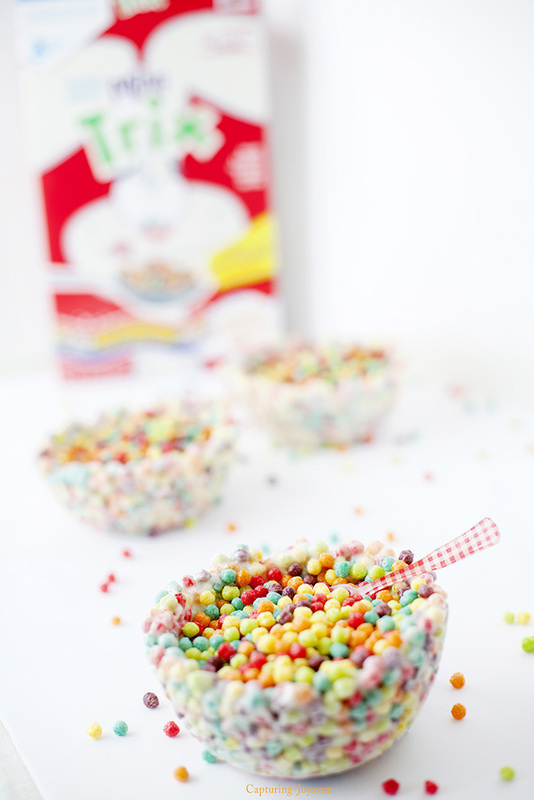 Cereal has always been a staple around my home, (growing up, and even now). It’s so easy to keep stored and quick to eat. My kids go through so many boxes each week, and I have to remind my growing teenage boys to PLEASE not have a bowl 10 minutes before dinner! 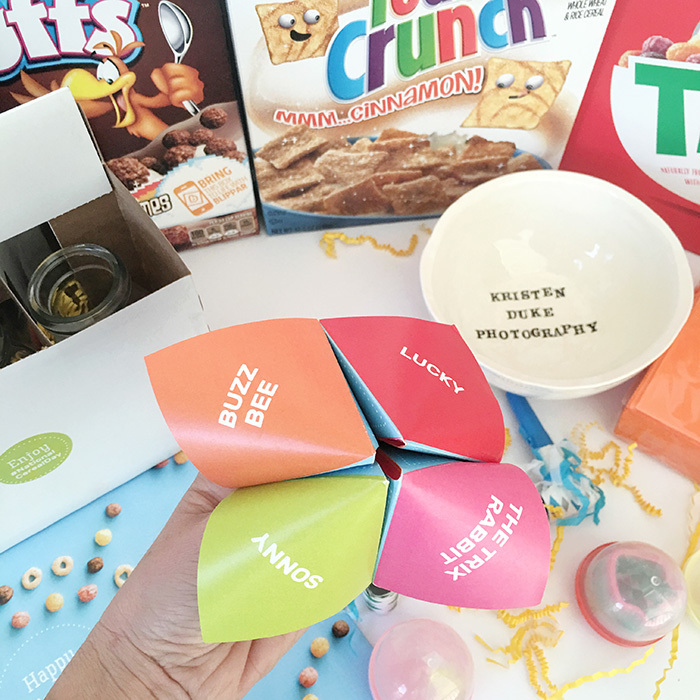 I was sent a box of cereal goodies from my friends at General Mills, and it was a compete surprise! 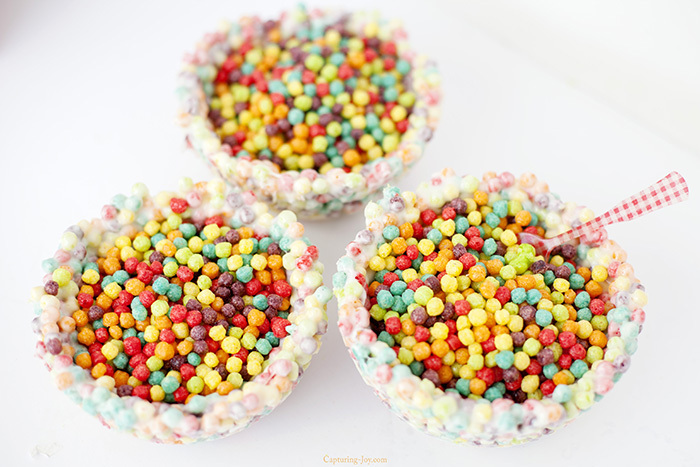 There were so many fun things inside, I thought it would be fun to say THANK YOU by sharing this Trix Cereal Bowl recipe with you all. This is DEFINITELY more of a treat/dessert recipe, since the bowl was made out of marshmallows, butter, and white chocolate. 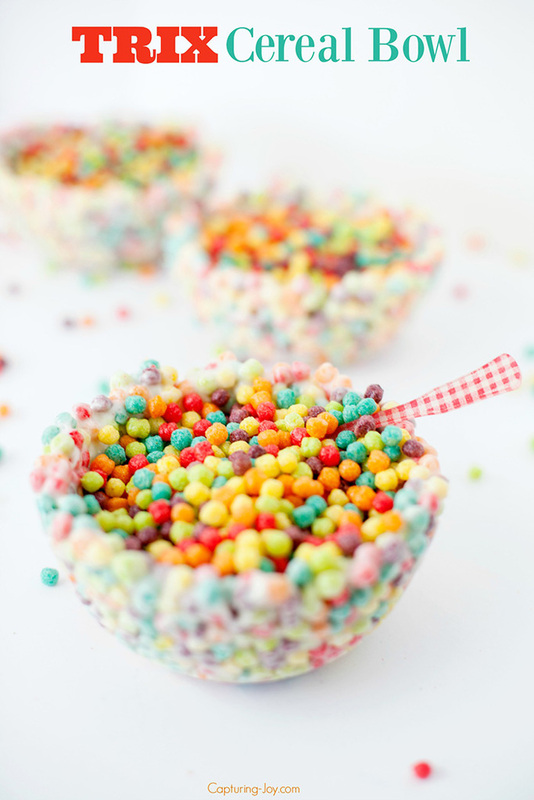 Trix has always been one of my favorites, and I seriously could.not.stop. eating the bowl part with the marshmallows mixed in–serious YUM! 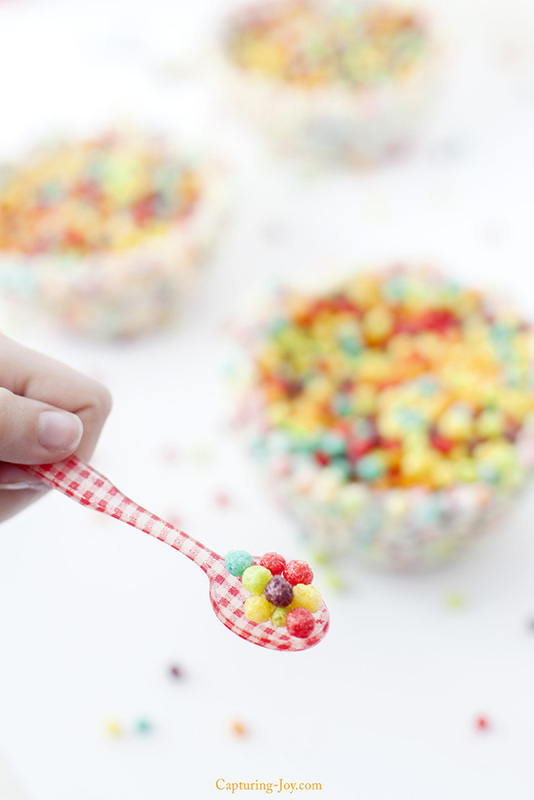 GO grab a box of your kids favorite cereal, and offer it as an after school snack in a cereal bowl…or even more fun, CEREAL for DINNER! I love the colors in TRIX, double the fun! Simply melt the marshmallows, butter, and white chocolate together. I do this in a microwave for 1 minute, stir, then 15 second increments. After it’s all melted, pour in 4 cups of cereal. 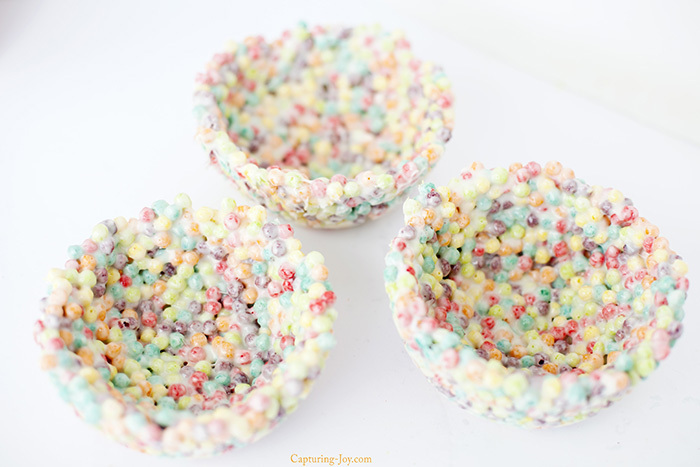 I wanted to make sure the bowl stayed together well, so there was more marshmallow to cereal ration than a normal cereal treat might have (normally 6 cups). 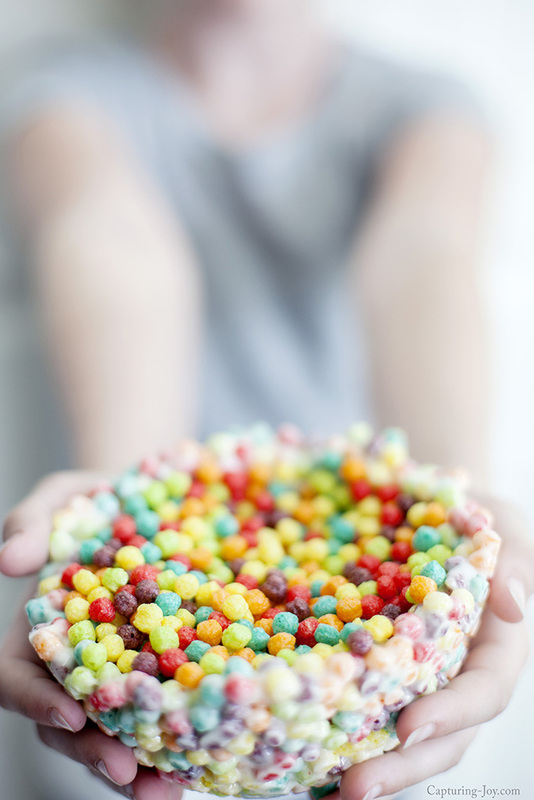 After you’ve got the mixture, get some butter on your hands, and butter the inside of your favorite cereal bowl, and mold the mixture to the bowl, patting and pressing it firmly together. I popped it in the freezer for 10 minutes to meld together more. I then slid a butter knife between the bowl and the treat, to pop it right out. 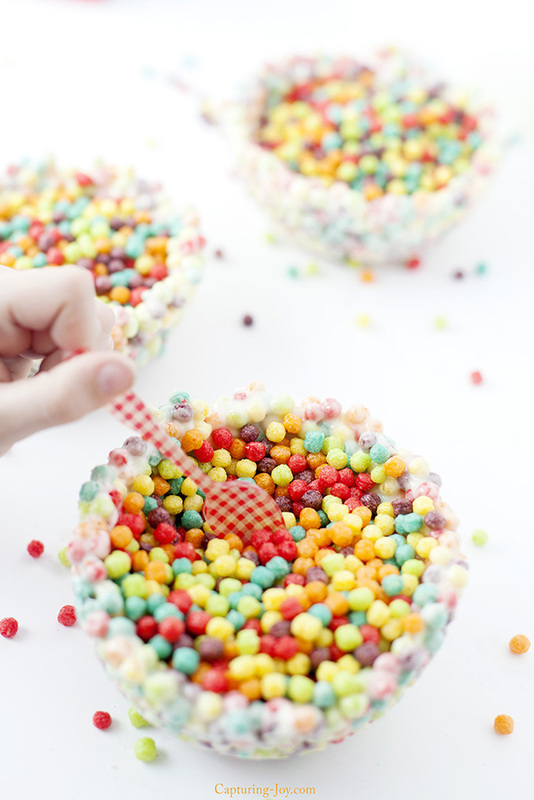 The kids will think this is so much fun, surprise them with a cereal bowl after school today! I did not pour milk in, but if you put it back in the bowl that shaped the cereal bowl, it’d be fun to eat out of it that way. 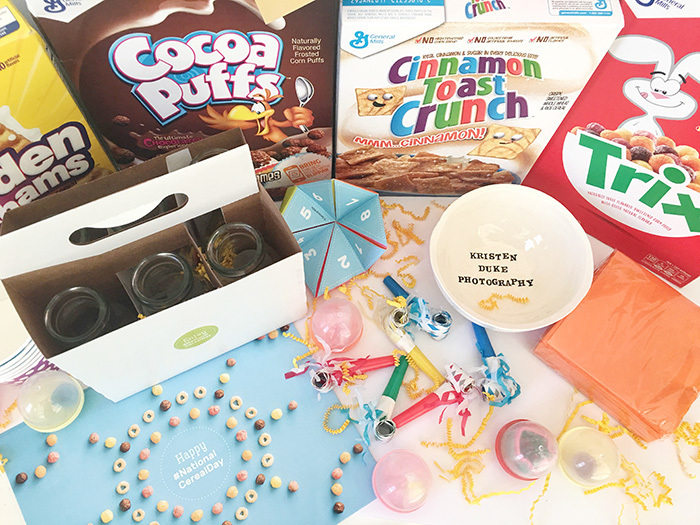 Though I was sent a surprise box of cereal goodies from General Mills, I decided to do this post on my own, without payment, just for fun, because I love cereal THAT much!